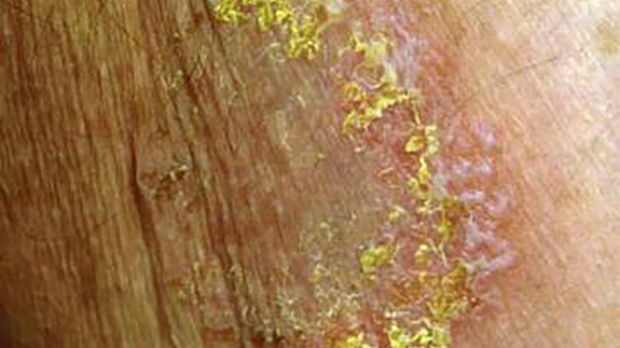 Hailey-Hailey disease (familial benign pemphigus), is characterized by chronic, recurrent vesicles, erosions, and maceration on the backs of the knees and the insides of the armpits, elbows and groin. Hailey-Hailey disease (HHD) is a genetic disorder that results from mutations in the ATP2C1 gene and it can be challenging to treat. A recent study looked at the use of low-dose naltrexone as a novel treatment option. The case series followed three patients with HHD who had not achieved resolution of their symptoms with prior treatments that included topical and systemic corticosteroids, antifungals, antibiotics, and dapsone. Each patient started a regimen of low-dose naltrexone hydrochloride (1.5 mg/day) that titrated to 3.0mg/day within a month or during flares of HHD. Patient one exhibited 80% clearance of HHD disease by 3 months, and the results had been sustained 9 months into treatment, with mild flare-ups every few months. Patient two also exhibited a sustained 80% improvement in extent of disease. Patient three exhibited 90% clearance in extent of disease. Low-dose naltrexone may be an effective treatment for several inflammatory disorders and has shown promise in treating fibromyalgia, Crohn’s disease, complex regional pain syndrome, chronic pruritus, and multiple sclerosis. While the higher doses that are used to treat opioid addictions come with some undesirable side effects, most patients who use the low-dose formulation reported few adverse effects. The authors conclude that although this use of naltrexone is off-label, it nonetheless may represent a low-cost and low-risk alternative or adjunct in the treatment of HHD. They note that larger sample sizes and further study are needed to evaluate the safety risk and generalizability of their findings.